Shout out your support on your purse, backpack, hat…anywhere! 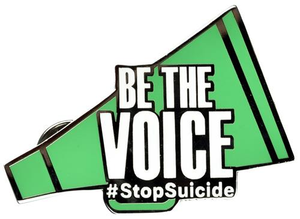 This megaphone-shaped pin comes in green, featuring “Be the Voice, #StopSuicide,” lettering in white, with two pinpoints for a sturdy fit. 1.75” x 1.25”. Sold individually.